Optical and electronic image stabilization is fast becoming as standard in smartphone cameras as an LED flash, but we still have loads of videos shot before our phones could eliminate the shaky cam effect. Now Google Photos is here to help. In the latest update rolling out in the Google Play Store, the long-expected video stabilizer finally makes its debut. The feature will use Google’s software magic to smooth over the rough spots in the videos in your library, applying electronic stabilization as if they were taken right on the Pixel. To find the stabilizer, simply open a video and tap the edit (pencil) icon. The video will download to your device (if it isn’t there already), and you’ll see a new Stabilize button at the bottom. Tap it and a progress bar will appear as it begins to work. The length of time will obviously vary, but in our testing it took about twice as long as the video (around two minutes for a minute-long video). When the process is finished, the button will now say “stabilized,” and you can watch the new video and save it to your photo library. Keep in mind that there will be some cropping of the original video, however, you can tap the Stabilized button to toggle between the two versions while it is playing. And Google will save a copy in your library so you can always go back to the original. In its teardown of the APK, Android Police also discovered a quixotic reference to “Austin’s Mystery Feature” buried in the code as well as some references to Google+ integration. If the update hasn’t hit your phone, you can side-load the Google-signed APK from APKMirror. Get the picture: We’ve said it before and we’ll say it again, we love Google Photos. From the organization to the speed, it’s by and large the best photo management app on any platform and one of the apps we use the most on our Android phones. 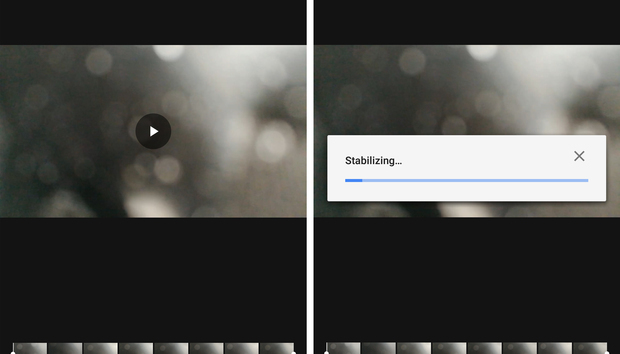 And the new video stabilization in Google Photos proves again just how far ahead of the competition it is.